Show her that you love her a ton with - what else? 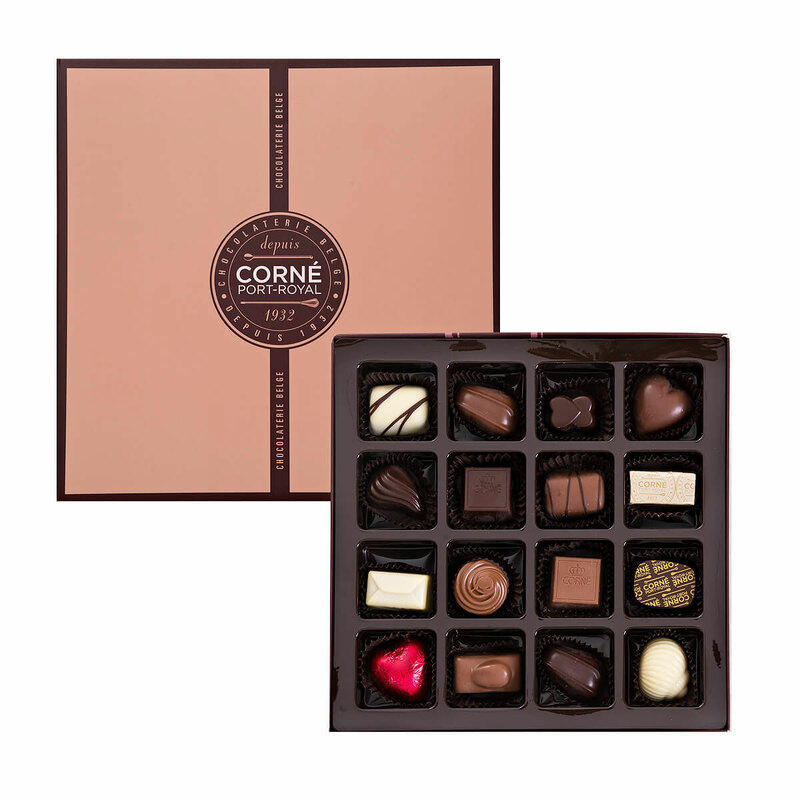 - a ton of delicious chocolate from Corné Port-Royal. 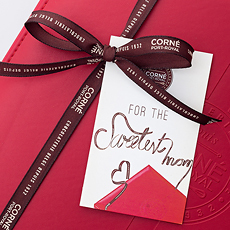 The master chocolatiers of Corné Port-Royal know best how to conquer her heart. This chocolate tower offers a range of creamy dark, white, and milk chocolates in all shapes and sizes. 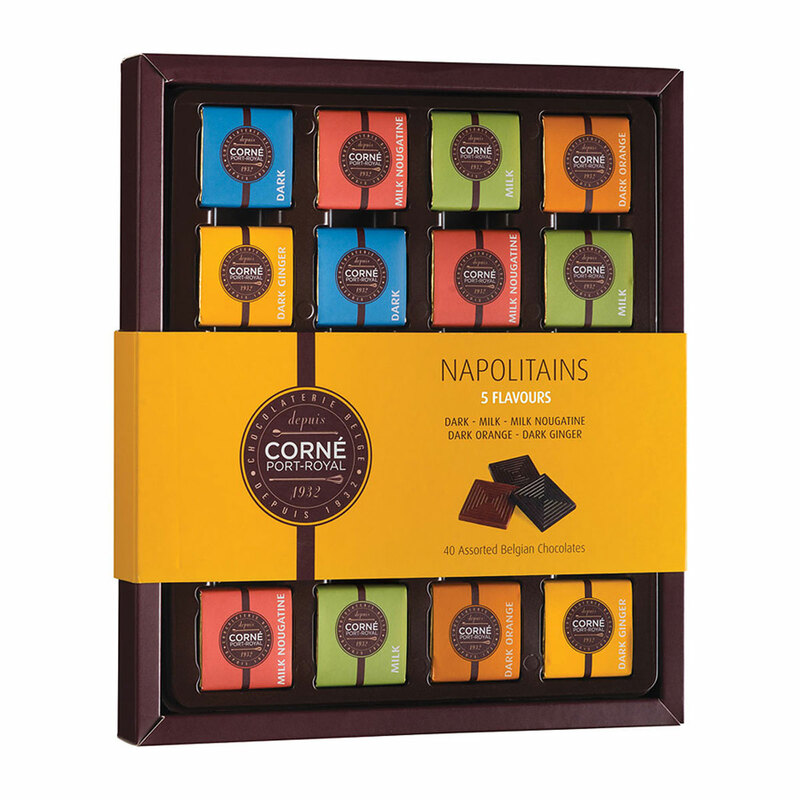 The first layer of the tower offers a beautifully wrapped gift box with 40 irresistible Napolitains: square dark, milk, milk & nougatine bits, dark & orange, and dark & ginger chocolates. The square gift box and the red leather gift box each offer a tempting range of Corné Port-Royal classics: a praline for every moment. 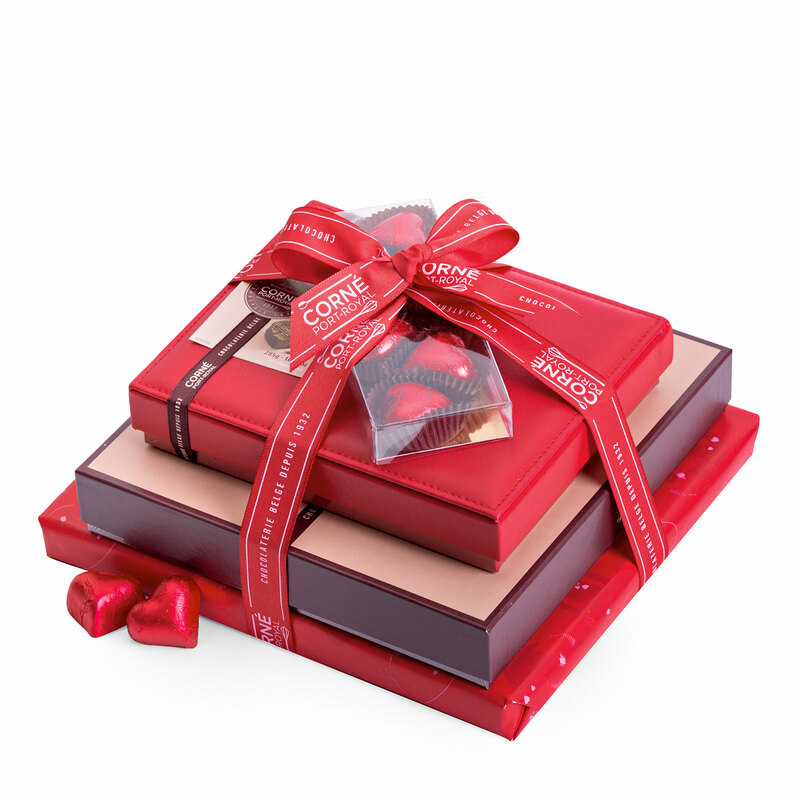 As icing on the cake, you will find 6 delicious, heart-shaped chocolates on top of the tower. 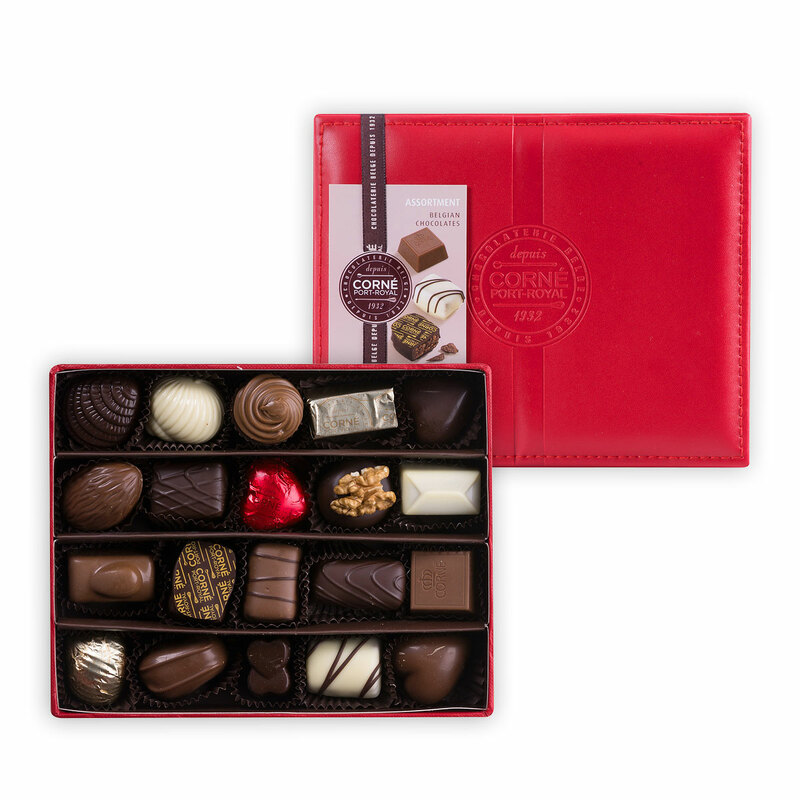 The soft praline filling will undoubtedly make her heart skip a beat. Ingredients: Sugar, cocoa mass, cocoa butter, whole milk powder, hazelnuts, almonds, anhydrous milk fat, vegetable fat, water, glucose syrup, skimmed milk powder, nuts, rice flour, roasted almonds, stabilizer: sorbitol, emulsifier: soya lecithin (E322), wheat flour, low fat cocoa powder, honey, rapeseed oil, flavour: vanillin, Candi sugar syrup, vegetable oil, glucose, coffee, orange peel, malt flour (wheat), cream, natural flavour: caramel, natural vanilla, natural flavour: vanilla, salt, emulsifier: mono- and diglycerides of fatty acids (E471), preservative: sorbic acid (E200), stabilizer: E1103, dextrose, beurre d'Isigny, fructose syrup, natural flavour: speculoos, natural flavour: orange, pistachios, natural flavour: bergamot, walnuts, egg white, natural flavour: lemon, raising agent: sodium bicarbonate (E500ii), soya flour, cinnamon powder, acidifier: citric acid (E330), xanthan gum (E415), preservative: potassium sorbate (E202), colours: E102* ; E110* (*may have an adverse effect on activity and attention in children), colour: E171, natural flavour: honey, emulsifier: E473. Allergy Advice: Contains: milk, eggs, soya, nuts, hazelnuts, pistachios, almonds, gluten. May contain traces of sesame and other nuts. Ingredients: sugar, cocoa mass, cocoa butter, whole milk powder, roasted hazelnuts, roasted almonds, palm oil, glucose syrup, anhydrous milk fat, almonds, rapeseed oil, cream (contains milk), stabilizers (glycerine, sorbitol syrup), rice flour, emulsifiers (soy, sunflower & rapeseed lecithin), wheat flour, skimmed milk powder, sunflower oil, low fat cocoa powder, condensed milk, natural flavours (vanilla, cocoa, caramel, speculoos, orange, honey), non-hydrogenated coconut oil, invert sugar, honey, candi sugar syrup, orange peel, coffee, fresh cream (crème fraîche d'isigny A.O.P. ), fructose syrup, salt, flavour, butter< (beurre salé d'isigny A.O.P. ), natural vanilla, saccharose, milk proteins, raising agent: sodium bicarbonate, salt (sel de guérande), malt flour (barley), soy flour, cinnamon powder, acidifier: citric acid, preservatives (potassium sorbate, sulfur dioxide), colours (curcumin, titanium dioxide). Ingredients: Cocoa mass, sugar, cocoa butter, whole milk powder, emulsifier: soya lecithin (E322), ginger powder, hazelnuts, natural vanilla, natural flavour: orange. Dark chocolate contains: cocoa solids 60% min. Milk chocolate contains: cocoa solids 36% min., milk solids 17% min. Allergy Advice: Contains milk, soya, hazelnuts. May contain traces of nuts, sesame and gluten.